"Then Moses and the children of Israel sang this song to the Lord, and spoke, saying: 'I will sing to the Lord, for He has triumphed gloriously! The horse and its rider he has thrown into the sea! The Lord is my strength and song, and He has become my salvation; He is my God, and I will praise Him; my father's God, and I will exalt Him.'" (Exodus 15:1-2). Love, joy and happiness are our key to successful life, and without them our life is miserable and impossible! The question is: what kind of joy, love and happiness are we searching for? Many people are searching for the wrong love, joy, and happiness and wonder why they are suffering, disappointed, and miserable. We see this in the story of the Israelites. They encountered miracle after miracle in the land of Egypt during their rescue by God from Egypt. God was giving them a chance to see the work of His hands, to trust that He will provide them with everything they need and that He will never forsake them. After they crossed the Red Sea they showed their love and their gratitude to God by praising Him with a song of appreciation for the work He had done. However, as soon as they encountered an obstacle, they grumbled and became ungrateful and unwilling to cooperate with the prophet Moses. "Then the Lord said to Moses, 'Behold, I will rain bread from heaven for you. And the people shall go out and gather a certain quota every day, that I may test them, whether they will walk in My law or not. And it shall be on the sixth day that they shall prepare what they bring in, and it shall be twice as much as they gather daily.'" (Exodus 16:4-5). God never ceases to comfort His people or give them what they need in order for them to walk with Him and not be tempted by the work of the devil. Although God meets all our needs He asks us to be attentive to Him, to glorify Him and to do our part and He will supply the rest. During the Israelites' forty years walk in the Sinai desert, unbelievable miracles happened almost every day and yet, they were afraid and unsure of their next step! They did not trust God's ability to help and rescue them in their time of need. Because their heart was away from God, they became blind to His works and all they saw was a desert with many obstacles. We experience the same! We are too occupied by our daily life that we forget to thank God for all the amazing things He does for us every minute of the day and we grumble whenever we face an obstacle! God wanted to test the Israelites' spiritual life with Him, their loyalty and ability to trust Him and be content, therefore, He sent the Manna—the Bread of Heaven! 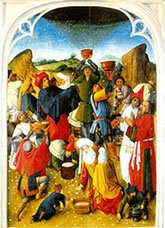 In the morning, after the dew had disappeared, the manna fell down. It was like seeds or grains coming down from heaven every morning to supply their hunger in the desert. The rule was that they only take their need of food and not to keep it for the next day. This rule intended to teach them obedience to, and trust in, God that He will supply their needs again the following day. Moreover, it was an example of our spiritual walk with God, which we need daily until we realize that we need God in our lives every day of our lives on earth. This example will help us grow in our relationship with Him and energize this relationship. However, the Israelites looked at the manna and started to murmur, wondering what it was that was falling from heaven, and which had no particular taste! After a few months, the Israelites were not happy or content, but rather were grumbling. They asked Moses for meat because they were neither satisfied nor content with what God provided and they wanted more to satisfy their hunger. The same happened at the time when Jesus Christ was on earth. Many people looked at Him and murmured about who He was, where He came from, and why He wanted to give Himself as food instead of real food. Therefore, they left Him and did not walk with Him. Like in the time of Jesus on earth, many people want to satisfy their body more than their spirit! They toil all day and sacrifice their spiritual walk with God for the purpose of making money or gaining prestige or acquire beauty, etc. "Then Moses and Aaron said to all the children of Israel, 'At evening you shall know that the Lord has brought you out of the land of Egypt. And in the morning you shall see the glory of the Lord; for He hears your complaints against the Lord. But what are we, that you complain against us?' Also Moses said, 'This shall be seen when the Lord gives you meat to eat in the evening, and in the morning bread to the full; for the Lord hears your complaints which you make against Him. And what are we? Your complaints are not against us but against the Lord.'" (Exodus 16:6-8). Let us stop here to contemplate on what is happening in our life. God never ceases to watch over us. God knows what we need in order to survive in this world and become one with Him and He does not want us to be spoiled and go astray, so He supplies us with things according to His wisdom. But when He sees that we are grumbling and not accepting His choices for us, He lets us go according to our freewill and not according to His will. He lets us satisfy our egos and pride and He waits for us to return back to Him. The manna is a symbol of our Lord Jesus Christ, who came down from heaven in order to save us. He gave us His Body and Blood (the communion) when He sacrificed it on the cross as a spiritual nourishment to sustain our life with Him, and be one with Him. However, many people grumbled and rejected Him. They would rather satisfy their own ego and pride than submit and be content with God's choice for them. May the Lord open our eyes to see and taste the manna in our lives and come to Him with our free will in order to experience the true meaning of love, joy, and happiness in our lives!